There are a few distinct things I’ve been a fan of since childhood (good books, good movies, good Chinese food etc. ), and chief among them are basketball and music. There were no real outdoor courts in my small Maine town growing up, so my crafty father built me the most beautiful and rugged outdoor court you have ever seen. I spent hours a day firing away at that hoop, imagining hitting buzzer beaters and playing one-on-one against whoever was around that day. To this day, a hoop in the driveway is a mandatory item for me, and my daughters and I spend a lot of time out there when the weather is cooperative. Likewise, music was a huge part of my childhood. My parents owned a Christian bookstore during a pivotal period of my life, and brought home new music pre-releases almost weekly (early Michael W. Smith, Petra, Whiteheart etc.). I’d put my huge boom box (remember those?) out by the hoop, and that made for a killer afternoon in my world. To this day, music and basketball make up a huge percentage of whatever “free time” I have, and I try to work them into the daily lives of my family, to try to pass on the love. (No pressure here girls.) I coach my girl’s basketball team in the winter months, and one of my favorite things to do is making practice play lists to blast during warm ups and drills. It makes the cold gym that much warmer, and that much more positive a place. This year Blanca, Britt Nicole, Tobymac, Owl City and Capital Kings made up a good chunk of the tunes cranked out, and it was also a neat, non-threatening way for my family to spread the gospel and to talk about our faith. I also love to watch basketball, and this year in the NBA, there were two teams that were heading towards breaking the all-time wins record for a season, held by the Michael Jordan-led 1995-1996 Chicago Bulls, who went an amazing 72-10. Both the current champions, The Golden State Warriors, and former champs before that, the San Antonio Spurs, had a chance to beat that record, (the Spurs are now out of the running, but the Warriors still have a chance to do it), and watching two teams play the game to perfection, with all the right kinds of passing, defense and selflessness on display, is a fan’s dream come true. Two teams doing it is a one-in-a-hundred years kind of thing, like Babe Ruth and Lou Gehrig going after the home runs record in baseball while being one the same team nearly 80 years ago. Which brings us to the music. Though it’s not a “competition” in terms of the art, Christian Music (loosely defined as music that is created by Christians and gets play in that genre’s outposts, though both bands mentioned here exist in a few different genres) has a version of these two teams; artists who seem to be at the peak of their game, releasing a string of great albums and songs that show spiritual rock and roll at its best and most uplifting. Since both bands have topped JFH’s “Best Of” album list in the past few years, and both are releasing new albums this July (also, they just toured together at length), the two bands seem inexorably linked, and discussing them together just makes sense. 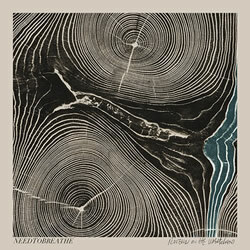 For Needtobreathe, I think their current hit streak goes from their third album (The Outsiders) to their last one (Rivers In The Wasteland) and quite possibly their upcoming one as well (July’s Hard Love). Switchfoot has been in full stride since Hello Hurricane. Add to this some great cultural commentary (one of rock and roll’s great tasks) in Needtobreathe’s “White Fences”, “Where The Money Is” and “Money And Fame” and Switchfoot’s great take on the fear mongering of the modern news cycle (“Selling The News”) and the Church’s bad habit of emphasizing Heaven to the detriment of spiritual engagement down here (“Afterlife”), and you get two fully-formed artists plumbing some great depths of the human condition. But it is also refreshing to turn on Air 1 radio and hear Needtobreathe and Switchfoot, (and to see them at my local Christian music fest.) They represent some of the best music on that station, and they are comfortable in that world too, doing interviews and “behind the music” background spots. I’m glad they make an effort to be in this neck of the radio dial too. Both bands represent the best of what good art in the hands of a believer can do, and that they are both firing on all cylinders at the same time is a unique moment to be savored.